Most sports players value the necessity of having a travel bag. Tennis players too, value a tennis-specific bag to keep all of their equipment secure, organized and accessible. However, there are hundreds of styles and designs that make it complicated to pick the right one for yourself. This blog is here to help! It is important to understand the different types of tennis bags available and decide which features are more important to you. This should be your biggest consideration when choosing a new tennis bag. If you play tennis recreationally and do not consider it to be your primary hobby, then a two or three-pack will do just fine. But if you are more serious and play four to five days week, then you will probably carry more equipment and need a six-pack bag or larger. Professionals often have six to eight racquets with them for one tournament and need a nine to fifteen-pack just to carry all of their equipment. Storage can be minimal or grand depending on how much you think is necessary. But remember: it is safer to get a larger storage bag because you never know when you might need that extra space. Durability should be the second consideration when you are searching for a new tennis bag. If you travel to tournaments and matches with your bag on a consistent basis, you want something that can take a while to break or tear. The recent trend for bags is to become lighter but more durable on the outside so users do not have to worry about fraying threads or missing zippers over time. Additionally, many bags come with technology that protects your tennis gear from extreme weather conditions. This is especially necessary for players that play primarily outdoors or in warmer weather. This is the most underrated aspect of your tennis bag and should be considered strongly regardless of your playing level. Lots of bags have become more user or travel friendly. Well-designed straps and handles will give you the most comfort whether you travel across the country or down the street to play. It is also important for the bag to have a good internal organization system so the bag can be carried in any way possible. Having to rearrange your equipment just after making it to the car from the house is the worst feeling ever. The design of the bag will be important for how everything fits inside. Lots of players bring drinks, towels, extra clothes/shoes and valuables with them to the court. Most tennis bags come with moisture protective sacks which are used to hold wet clothes or shoes after a grueling match. Thermal lining technology is also commonly used to protect the contents of your bag from extreme weather and outside moisture. Although the external design is more for style, the inner compartment design is serving a greater purpose which helps you tremendously. If you are an occasional tennis player who stops by the neighborhood courts a few times a month, or a beginner who is just getting a feel for the game, you probably own one or two tennis racquets. If that is the case, perhaps a three-pack bag would be sufficient for you. In a three-pack, you have one main compartment, which is big enough to accommodate three racquets at most. If you do not have three racquets, you will have room to include a change of clothes and some accessories. There also is an exterior zipper compartment used for keys, wallets, or smaller personal items. These bags usually come with a small single handle and a long strap for carrying over the shoulder. 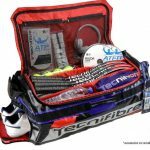 For more advanced players who like to carry a few backup racquets, as well as additional tennis gear, the six-pack may be the most convenient bag size. You will have one main compartment to hold two to three racquets, as well as a large adjacent compartment to hold an extra pair of shoes, a change of clothes, snacks and a few other items. Some bags will include a thermal lining for the large main compartment, but it is not as common with the six-pack. On the outside you will still have one small zippered compartment to hold your personal valuables. Not all six-packs are the same, but you will find more of these bags with backpack style straps as well as a central handle for comfortable carrying. Tournament and junior players will love the eight, nine and ten-pack options. 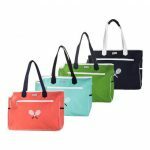 These bags usually feature three large pockets capable of holding up to nine racquets as well as other tennis essentials. One compartment will usually feature thermal lining insulation to help protect your racquets from extreme temperatures and outside moisture. The other two pockets and exterior accessory compartments hold everything from an extra pair of shoes to sweaty clothes. Many come equipped with a moisture-proof pocket which comes in handy when you sweat a lot. Backpack straps are very common with these bags so they can be carried easily. You will find a small handle near the top or middle of the bag for quick and easy moving. For those high-intensity players, the twelve-pack is the way to go. 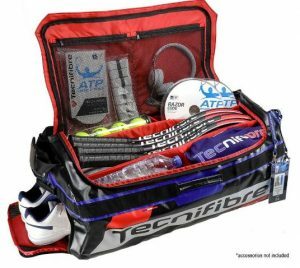 There usually are one or two large compartments with thermal lining that can hold up to twelve racquets as well as an additional large compartment for extra clothes, towels or tennis equipment. Great for tournament travel, twelve-pack bags feature additional perks such as backpack straps, shoe compartments and multiple accessory pockets for convenient storage. The fifteen-pack option has twelve-pack features with slightly more space built in to the three main compartments. These bags are usually the top-of-the-line bags, which include the many features and the highest quality. Most of these large bags have multiple storage compartments on the outside as well as on the inside. Backpack straps and one or two smaller handles will be on these bags so you can carry them around easily. 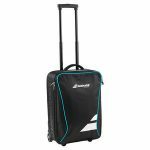 Rolling tennis bags are great for players who like to take their tennis gear with them on long trips. With enough room to store in excess of twelve racquets, and as much gear as you can add, these are not your average court bags. Usually complete with one or two small handles and a smooth-wheeling motion, these bags are easy to transport. In addition, firm carrier straps offer versatility in case wheeling doesn’t work and you need to carry or lift this bag. The racquet backpack is a great option for players who hit the court on an intermittent basis. Backpacks usually feature enough room to fit one or two racquets and they can be a comfortable alternative to the longer racquet bags that hang off the shoulder. 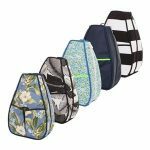 These compact carriers have compartments for water bottles, tennis ball cans and small tennis accessories. Looking for a simple and stylish bag to carry your tennis gear? Tote bags are the perfect solution. Featuring fortified shoulder straps and eye-catching designs, totes can add personality to your game while transporting your racquets, tennis gear and personal items. 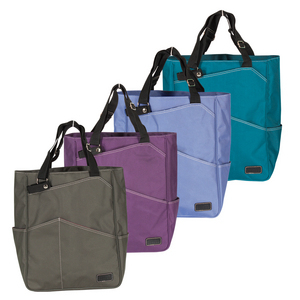 Similar to backpacks, totes can be used for traveling too. Tournament bags will be similar to a three or six-pack bag. 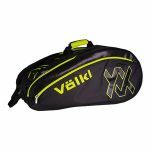 Typically, these bags feature one or two large compartments suitable for carrying racquets and some additional gear. They usually have a carrying handle and/or one main shoulder strap for travel. Duffel bags are a great way to carry your extra apparel. 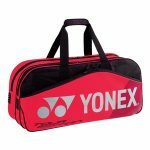 Manufacturers these days are making various sizes of duffels so you can carry your racquets with you. You will see pro players on television using a duffel bag for just their clothes and/or shoes. These also are great for business or personal travel. Racquet covers are a great way to protect your racquets against dings, dents and scratches when jostled in your tennis bag and can be used as a lightweight alternative to transport your sticks. These stylish, yet simple, covers can also be used to organize your racquets if you have racquets strung at multiple tensions. Some manufacturers do include a cover with the purchase of a new racquet. 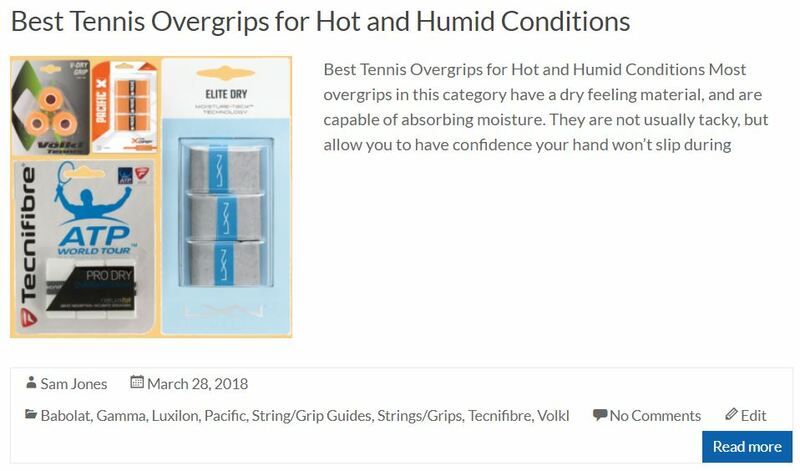 Racquet covers are very easy to use, but they do not protect against extreme weather or moisture and do not allow for much storage other than the racquet. Have you ever pulled your shoes out of your bag sometime after a long match and couldn’t stand that nauseating smell? Shoe bags are a great way to keep your shoes separated from the rest of your gear. Whether you want to carry it in your main bag or carry it separately, you will have an effective way to keep your gear clean and smelling fresh. These will be relatively small and only have room for a pair of shoes or sandals. This is a great investment for players that have stinky shoes and do not want to continuously put shoes in their main bag. 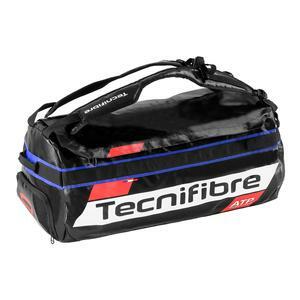 Tecnifibre continues to lead the industry with the updated Rackpack Pro. This bag is lined with Tarpaulin, a strong durable material that is unbreakable, easy to clean, water-resistant and protects your gear from UV rays. 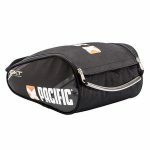 It offers ample organizational features and has a middle compartment that holds three to four racquets and sides that can be set up with compartments for holding other essential gear. There are also two mesh zippered pockets to keep more of your smaller items organized. The large, ventilated shoe pocket on the exterior is big enough to hold a pair of shoes or your dirty gear. There is a small accessory pocket on one end to keep small items organized. The all-in-one carrying system allows you to carry the bag as a backpack or over your shoulders with the two padded, adjustable straps. The Djokovic 12R Monstercombi Tennis Bag is no joke when it comes to storage and style. 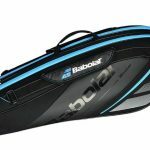 Unique to this bag is its PVC-free fabric construction, making it one of the safest and most environmentally-friendly tennis bags on the market. There are two large main compartments that allow you to carry up to twelve racquets with one compartment lined with Climate Control Technology+ to provide protection from external conditions. On the interior are small zippered ventilated pockets that are great for securing extra racquet accessories. On the top you will find a large compartment perfect for storing shoes or sandals and a strap handle to carry the bag easily. There are small hard-shell pockets on the sides which are ideal for holding your personal items such as your wallet, car keys and cell phone. The bottom has a padded area and backpack straps, so you can comfortably take your bag anywhere. The Maggie Mather Tennis Tote bag is one of the best on the market today. 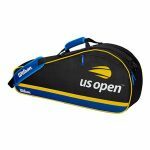 It holds up to two racquets and has double-stitched construction that makes it durable for on-the-go travel. It is available in many unique colors and this is one of Maggie Mather’s flagship bags. The exterior has seven different storage pockets while the interior features a zippered pouch that keeps your valuables safe. 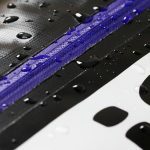 It is made with water-resistant fabric that keeps everything dry in the rain. This performance backpack from Wilson will be all you need for the tennis court. The large compartment is perfect for carrying apparel, towels and an extra can of tennis balls. 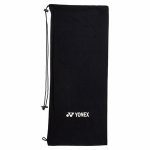 The large front pocket is great for separating clean and dirty clothes or shoes. Two small accessory pockets can be found on the outside; one for securing small valuables while the other features Thermoguard technology to store your water bottles or snacks. 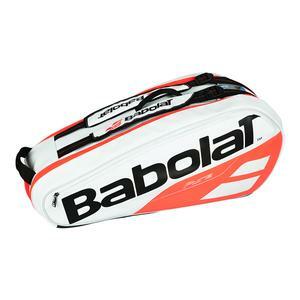 The Babolat Pure Six-Pack is perfect for competitive players that need the perfect combo of storage and protection. 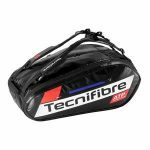 The bag carries up to six racquets with one large insulated compartment to protect your racquets from external weather conditions. There is a hard shell pocket on the outside to protect fragile accessories. You can carry the bag with the backpack straps, central handle or top handle. 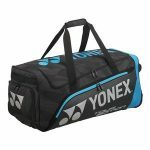 This Tournament bag from Yonex is sure to impress with its larger storage compartments and bright design. The two main compartments can hold up to three racquets, extra clothes and towels. There is a zippered outside pocket for smaller item storage as well as two long carrying handle straps. The Sophi Tennis Backpack by 40 Love Courture has chic style and fun designs that are great for players of all ages. 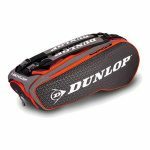 There is a padded sling strap for convenient carrying across the body, two exterior pockets for storage as well as an interior pocket to carry up to two racquets. All of the company’s products are handcrafted right here in the USA and come with a limited lifetime warranty.